Hydrogen from the natural gas pipeline – a separation technique developed by TU Wien is opening up new possibilities for our natural gas network and improves the ecological balance of hydrogen fuel cells. Hydrogen is a valuable source of energy. It is becoming increasingly important, primarily because it enables excess electrical energy from renewable energy sources to be stored. Electrical energy for households, hospitals or entire communities can then be produced in large fuel cells, smaller fuel cells can be used to power motor vehicles. However, there is not yet a comprehensive network of hydrogen filling stations. "There are two options available: either directly source the hydrogen locally by means of electrolysis or have it delivered, e.g. in large pressurised tanks," explains Michael Harasek. Decentralised electrolysis is very expensive, not particularly efficient and it requires powerful electric connecting cables. Transporting hydrogen in tankers is equally time-consuming and costly. But what if we could transport hydrogen using a system that already has ample capacity and is in top working condition? As Michael Harasek explains: "The natural gas network fulfils all the prerequisites we have for transporting hydrogen." A certain percentage of hydrogen is already added to the natural gas as an additional energy source – up to a maximum of 4% in Austria and even as high as 10% in Germany, depending on the region. Technologically, feeding hydrogen into the natural gas network is not a problem and the general natural gas customer does not even notice. But anyone who would like hydrogen can now have it specifically filtered out from this natural gas/hydrogen mixture. 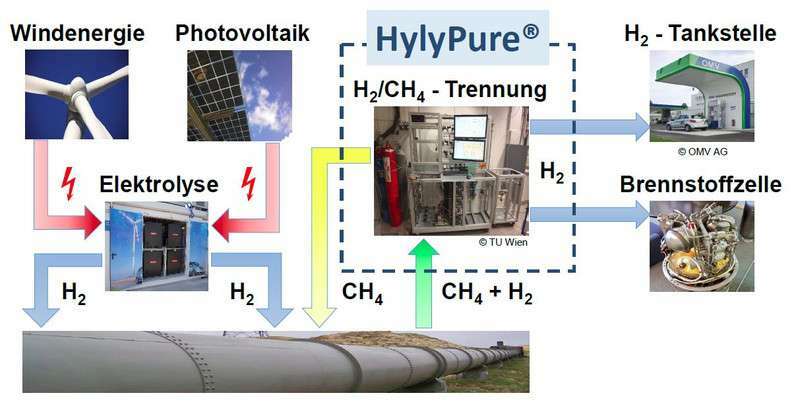 A two-stage process (HylyPure) has been developed by TU Wien especially for this purpose. With the help of membranes, which allow hydrogen, but not larger molecules, to pass through, the hydrogen concentration can initially be increased to 20–50%. Then, this mixed gas is purified further using a pressure swing adsorption process in which other molecules (e.g. methane) are specifically adsorbed by porous materials. This process even works under a high pressure of up to 60 bar, meaning it can also be applied to the primary gas network. The end product is hydrogen with a degree of purity of up to 99.97%. When developing the separation process, particular care was taken to ensure energy efficiency. The technology gets by with 8% to 12% of the electrical energy which would be required to produce hydrogen using electrolysis. 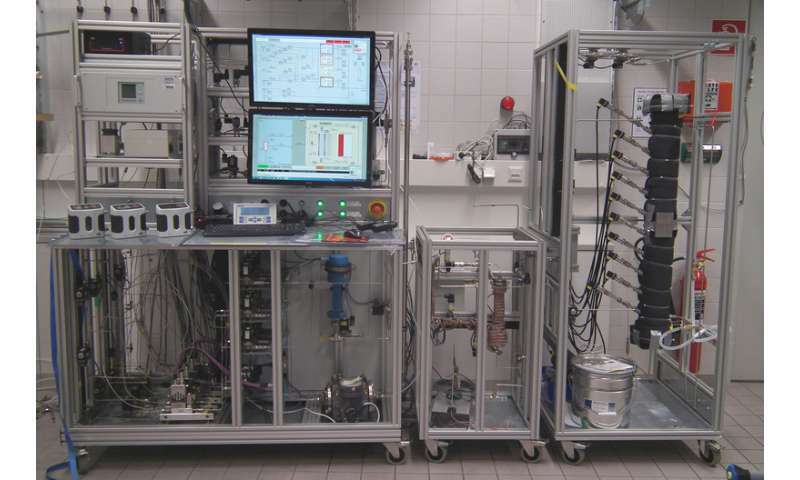 Using the method from TU Wien, high-purity hydrogen can be filtered out even with a hydrogen content as low as 1% in the natural gas network, with efficiency increasing as the hydrogen concentration gets higher. "We have already successfully tested the HylyPure technology together with our industry partner OMV AG" says Harasek. "We are now looking for other project partners, operators of natural gas networks, electrolysis systems and hydrogen filling stations."